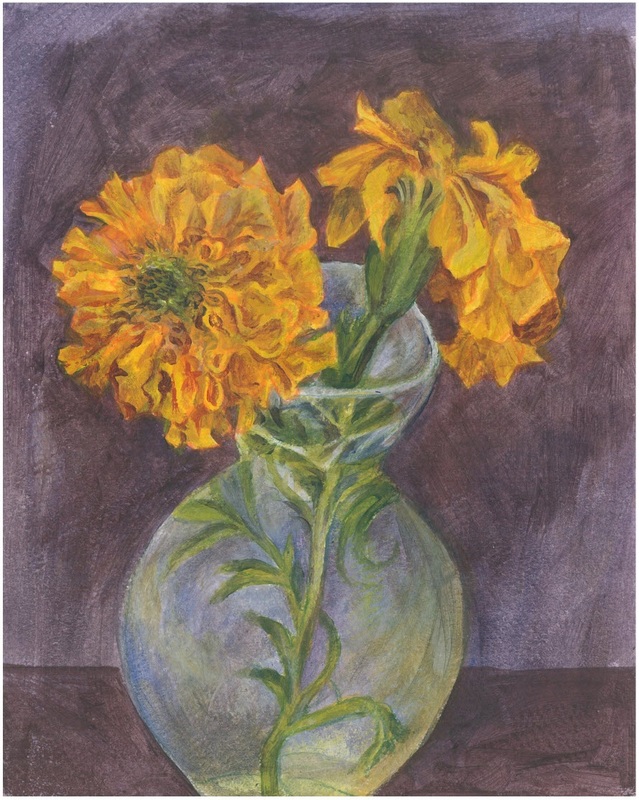 I have been painting marigolds all week. I now have seven small paintings, ranging from 3.5×6 to 8×11″, on different grades/textures of paper but using the same four tubes of acrylic paint. None are frame worthy, but even though I have not created any single piece of great merit I have made great strides as an artist this week. I feel pleased. I feel like I am starting a transition that has promise. There are three things that have come together to inspire the creation of these mundane yet momentous little paintings: a thick book on SQL programming, an anti-climatic Old Master’s Color Theory class, and an evening spent with one of my very oldest friends. The SQL book has actually been sitting here next to my bed for almost a month. Starting to learn remedial Structured Query Language has been one of my favorite parts of my current job. Managing to put together a few lines of code that make the database give me the information I want (and from different tables even) gives me a satisfying sense of accomplishment. I like the puzzle of it. I also just generally like it when I can do something today that I didn’t know how to do yesterday. Whether it was learning Spanish or learning to cut a case of lettuce to the right size in the right amount of time I enjoy the process of turning something that seems bewildering difficult if not impossible at first into something manageable. The strides I have made in understanding a small bit of what the programmers are doing has kept me from getting bored or discouraged in what many would consider a very deary job. I have fantasized of surprising everyone by being able to not just keep track of tickets in a queue but actually work them as well. Neither the thrift store nor the public library had any books on SQL so I was thrilled to find a used copy of what is supposed to be a good text on it at a greatly discounted price. I ordered it without hesitation and when it arrived I read the prologue immediately. It was when I started exploring the server where I keep this site to see if I remembered correctly that it offered the opportunity to create a MySQL database that I realized how neglected poor Azulita’s had been. I ended up spending several evenings updating images and trying to incorporate old posts instead, but the plan was still to read the book and learn to read and write the language. The Old Masters’ Color Theory class was 3 weeks ago. The blurb on it in the Georgia Art League’s schedule was tantalizing. “You will need to bring 1 average sized brush and three primary colors plus white: Ultramarine Blue, Cadmium Red Medium and Cadmium Yellow Medium. You will learn how to use the old masters’ painting techniques of Sfumato and Michael Angelo’s Cangiante and Raphael’s Unione.” I joined GAL, paid the yearly dues, and went and bought tubes of the required colors. However, despite my anticipation, no great Renaissance secret was revealed. Though the old masters’ panting techniques were defined and we got a nice handout of terms, what we actually were shown was how to create a color wheel. I have known for as long as I can remember that ‘yellow and blue make green.’ There was no sense of accomplishment in mixing the colors together and filling in shapes around a circle. I was disappointed at the time (you would think that by this point in my life I would have learned about the dangers of high expectations) but I found myself thinking about one of the instructor’s paintings. It was a large still life packed full of carefully rendered objects that held no particular allure, but she did the whole thing with just the four tubes of paint. That seemed an interesting challenge. I put the color wheel and my new tubes of paint on my art table with the plan to give it a try when I had the time. Last weekend I went to Boone. Being at my father’s house always makes me want to make art. This visit the desire was magnified by the figure drawing session I had been to the week before, the quality work we saw at the Turchin Center opening, (Andrew Abbot’s strong showing deserves a post of its own) and just the particular high that comes from being around artists and people who appreciate art. By the time I sat down to catch up with my dear old friend I was a bit giddy. I didn’t just want the good feeling of drawing, I wanted to be an artist, an artist period. I wanted my own exhibit at the Turchin. As I listened to Anthony tell me about his life and work I wanted a gallery in New York and international collectors as well. I wanted to be an artist like I had when I was twelve and I first met him on a trip to the Mint Museum. And just like way back then he was so enthusiastic and encouraging and he made me feel not just like it was possible, but that it was required. We had a wonderful time, great conversation about the past and the present, art and life, but it was a sentence in a facebook message that he sent me once I was home that made the difference. “I make it a strict policy to paint or draw at least 15-30 minutes a day, it is blissful and great therapy,” he wrote me on Monday evening. I was tired and stressed and laying on my bed mindlessly scrolling through fluff would have been my evenings main activity, but I read his message again. “I make it a strict policy to paint or draw at least 15-30 minutes a day, it is blissful and great therapy.” 15-30 minutes, surely I could manage that. I got off my bed and went to the art table. I looked at the in-progress pieces I had laying around, but each was in a stuck place I did not feel I had the energy to face. I needed something less strenuous, more like the color wheel, and there were those four new tubes of paint, just waiting. 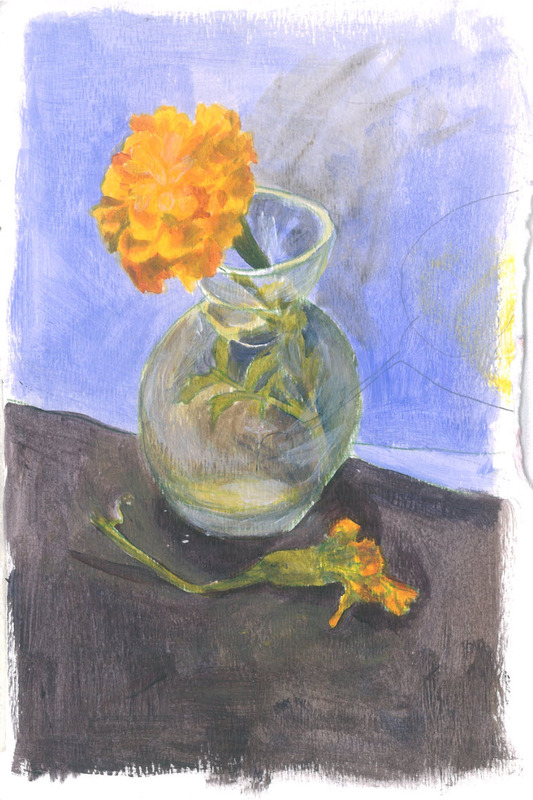 I considered putting together a complicated still life, maybe with some symbolism or irony, but instead I just went out front and picked two marigolds, one fresh and bright, the other withered. I found a piece of thickish sketch paper under the table that my daughter had just barely started painting on then discarded, tore it in half, and then squeezed out a bit of each of those four tubes of color. The painting that resulted was pretty awful. Tuesday I tried again on the other half of the paper. Wednesday I tried on a smaller but much nicer scrap. Thursday I mixed things up by painting on dark paper. Then I left off the withered flower and added a fresher one. 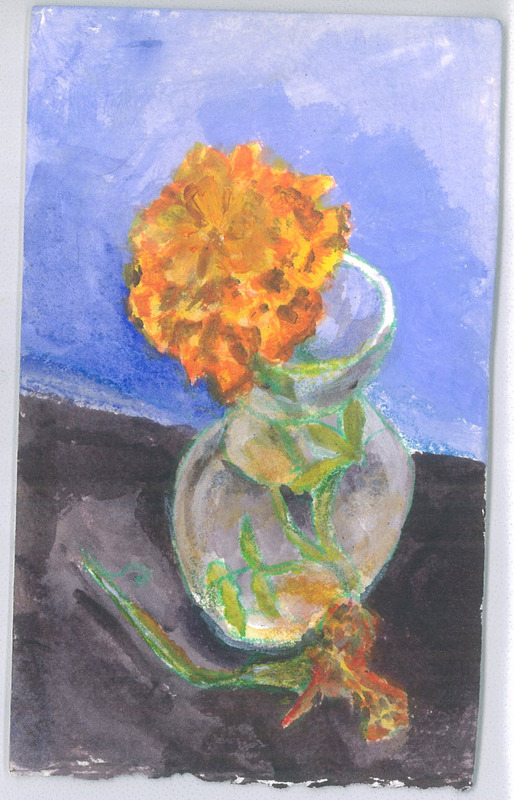 So tonight I have six small paintings of marigolds, each one a marked improvement over the last. I plan on doing other tomorrow. I don’t know yet if Monday I will let myself move on to a new subject or make myself stick to the marigolds, but the plan is to keep painting. Rather than try and learn a new skill just because it is new and different or unexpected it makes much more sense to spend my time and energy improving on the skill I already have and know I love. 40 is not too old to learn a new trade. If I retire at 65 I still have 25 years to go in the work force. If I really had a passion to be a software developer I could make that my focus and probably have a decent second career. But do I really want to spend the next 25 years sitting at a desk staring at a screen trying to figure out what line, or what character, is blocking all the rest from producing the desired report or graph or invoice? I think it is very likely that by the time I was proficient I would be bored. I have been a proficient artist for a while now. I am not bored, but it is time to stop painting the things I know how to paint in the way I know how to paint them. It is time to challenge myself to take my art to the next level in both quality and quantity. 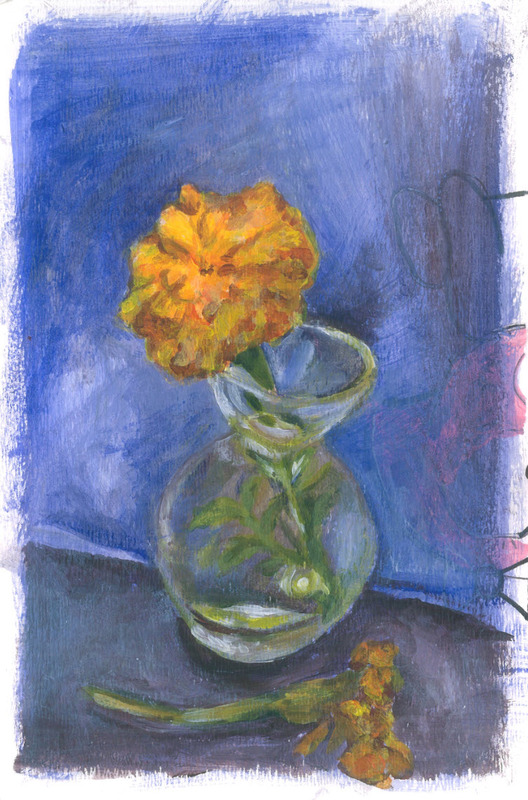 If I can make this much progress on a marigold in a week, imagine what I could be painting this time next year. What if in two years when all the lingering restaurant issues have been taken care of I have developed a reliable habit of studio time, greater technical ability and strong body of work? It seems entirely plausible that then I could be an artist, period.